Includes one adult size full face Batman mask. Mask is made of vinyl and features bat ears and cowl to cover the neck and top of the chest. One size fits most. With this mask you can dress up as Batman for Halloween or even a movie or superhero themed costume masquerade party. 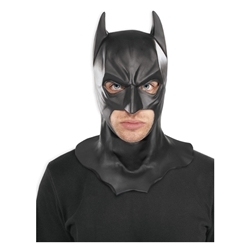 The mask can be worn with a batman costume or just a black outfit with a black cape for a quick and easy Batman costume.